Diamond Details: 82 Round brilliant cut white diamonds, F color, VS2 clarity, excellent cut and brilliance, weighing .37 carat total. 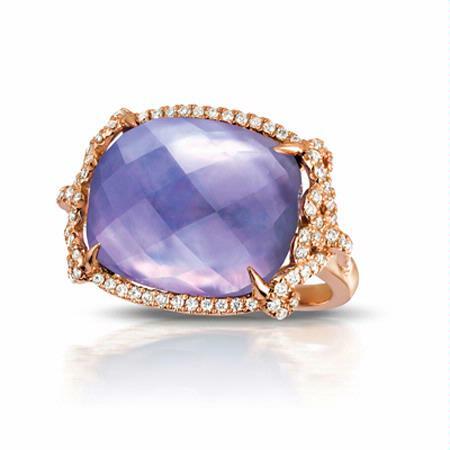 Gemstone Details: Mother of pearl and lapis over amethyst stone, of exquisite color, weighing 11.81 carats total. Ring Details: Doves 18k rose gold. This exquisite checker-cut over pink mother of pearl center, layered on a royal blue lapis lazuli ring base and set in 18k rose gold and diamonds, features 82 round brilliant cut white diamonds of F color, VS2 clarity of excellent cut and brilliance, weighing .37 carat total. Amethyst was ST.Valentine's stone of choice and is the February birthstone of exquisite color, weighing 11.81 carats total.